Question: How did my case come to Kodiak Teen Court (KTC)? Answer: Cases are referred to Kodiak Teen Court (KTC) from the Youth Corrections Office in Kodiak, from the District Court for Minor In Possession (MIP) offenses, as well as the Kodiak Island Borough School District (KIBSD) for infractions. To qualify for Youth Court, the offender must be under the age of nineteen (19), and have been charged with committing an offense or infraction. Most youth who qualify for this program are first-time offenders. Question: What can I expect from the Youth Court proceeding? In a Minor In Possession (MIP) or Tobacco case, sentencing arguments are presented by the prosecuting and defense attorneys. The defendant and the parents have the opportunity to present personal statements. Then, the panel of three (3) judges collaborate, and come to a conclusion on appropriate sentence for the defendant. The defendant has the right to appeal their sentence. In a Criminal Case, the defendant will be given an arrangement date for court. The defendant will need to decide on his or her pleas of: guilty, not guilty, or no-contest. Sentencing arguments are presented by the prosecuting and defense attorneys. The defendant and their parents have the opportunity to present personal statements, as well. Then, the panel of three (3) judges collaborate, and come to a conclusion on appropriate sentence for the defendant. The defendant has the right to appeal their sentence. If the defendant’s plea is not-guilty, a status hearing will be set for several weeks in the future. At that time, a trial date will be set or the defendant can change their plea and move on to sentencing. In a School Infraction Case, the student will be offered the opportunity to have their case heard in Teen Court, and most abide by the court’s ruling within a set date by the Kodiak Island Borough School District (KIBSD). Question: How long does court last? Answer: Court takes about an hour (~1 hour). You must arrive at the the Kodiak Court House (next to the downtown Wells Fargo Bank) one half hour (30 minutes) before your hearing in order to meet with your attorneys. Question: What if I know Youth Court members on my case? Answer: If a youth court member knows you personally, they are not allowed to judge or prosecute you. This is known to Kodiak Teen Court as a conflict of interest. A youth court member who knows you is allowed to defend you, if you choose. Question: How will I meet with my defense attorneys? Answer: A week (1 week) or more before court, you will receive a call from your attorney to discuss details of your case. You will have the opportunity to meet with your attorneys at the Kodiak Teen Court Office prior to your court date. 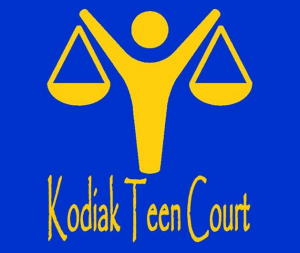 The Kodiak Teen Court Office is locate near the Kodiak Public Library and Kodiak High School. An address, email, and phone number can be found on our contact page. The day of court, you and your parent(s) or guardian(s) must arrive one half hour before the hearing to meet with your attorneys. Question: What type of consequences can I expect in my sentence? Paying restitution to the victim. Writing an essay, creating a poster or Power Point presentation about your experience. Write a letter of apology or apologizing in person to the victim or others involved with your case. Attending a viewing of adult court arraignments, cases, or sentencing hearings related to your offense. Attending a juvenile anti-theft class, a violence reduction class or counseling, or alcohol, tobacco, and/or drug education class(es) or counseling. Participating in Parenting with Love and Limits. Question: How should I dress for Court? Answer: You should dress in a manner that shows respect for the Court. This means better school cloths such as slacks/skirt and shirt/blouse rather than jeans and a t-shirt. Question: How long do I have to complete my sentence? Answer: You will be given thirty (30) to sixty (60) days to complete your sentence. Question: What happens if I do not complete my sentence? Answer: Your case will be returned to Youth Corrections (known as DJJ, or the Department of Juvenile Justice) to be handled in a more formal manner by the a State Probation Office. Question: What do I do when I have finished by sentence? Answer: Once you have completed your sentence, you need to complete the defendant survey and bring your sentence completion packet to the Kodiak Teen Court Office located at 610 Upper Mill Bay Road. The Kodiak Teen Court Office is located near the Kodiak Public Library and Kodiak High School. Additional information such as email and phone number can be found on our contact page. Question: What happens when I have successfully completed my Kodiak Teen Court (KTC) sentence? In a criminal case, upon successful completion of your sentence, the case will be closes with both Kodiak Teen Court (KTC) and the Department of Juvenile Justice (DJJ). The criminal charge will not show up as a conviction on your record. In a Minor In Possession (MIP), upon successful completion your case will be closed with Kodiak Teen Court (KTC), and a notice of successful completion will be sent to the court. You will receive a sentence completion letter in the mail letting you known that your Kodiak Teen Court case has been closed.